All images are copyright Ed Darack except where noted. 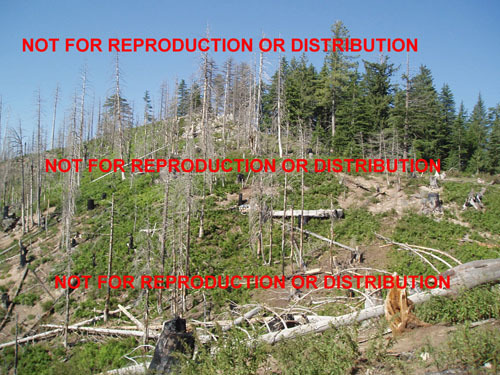 None are for distribution or reproduction. Berkley Books, a division of Penguin Publishing, will publish this book. Sawtalo Sar is a 9,282 foot high mountain in the Pech River region of Afghanistan's Kunar Province, approximately 15 miles east of the Pakistani border. It is also the working title of my next book, which documents two military operations planned and executed by the 2nd Battalion of the 3rd Marine regiment, Operation Red Wings and Operation Whalers. Some has been written about Operation Red Wings; very little has been documented of Whalers. An amazing amount of disinformation and missed-information clouds the details of Operation Red Wings. Sawtalo Sar will document both of these operations, one which is marked by tragedy, and the other, by success. Operation Red Wings was planned by senior Battalion (2/3) leadership in early June of 2005. The objective of the operation was to "disrupt anti-coalition militia operations that could affect the upcoming national elections," Translation: the Marines along with local Afghan forces would interdict those responsible for the creation and employment of IEDs (improvised explosive devices, commonly referred to as 'roadside bombs'), mortar and rocket attacks, and ambushes that destabilized the remote Kunar Province. The Marines used a slew of intelligence reports to pinpoint a small band of insurgents led by a man who went by the aliases of Muhammad Ismail, Ismail, and Ahmad Shah, among others. Shah and his group really weren't Taliban, but he was known to be associated with the infamous Gulbuddin Hekmatyar, who in 1977 founded Hizb-I Islami (HIG). More accurately, Shah's group was one of many who the battalion collectively termed ACM (anti coalition militia). While it is easy to denote ACM as "the Taliban" or "Al Qaeda," particularly for magazine articles where space is at a premium (and specific and accurate descriptions get edited out), Shah and his followers were never considered members of either group, although Shah certainly may have had indirect ties, primarily financial, to them. The battalion identified approximately 22 distinct groups operating in the Kunar Province alone in 2005, and Shah's was just one of them. The bottom line is that the Marines set out to smash his operation so that the upcoming elections could proceed smoothly in this part of the Kunar Province (they did). When I asked the primary planner of Red Wings if the Marines sought a kill/capture of Shah, I was told that Marines very rarely plan an operation around killing / capturing one single person, as such a goal is nearly impossible and not particularly effective in the long run nor an efficient use of assets. 2/3 was simply going to wreck Shah's operation, and killing / capturing him would be a bonus. A quick note on nomenclature: Typically, when a battalion comes in country, they decide on a unified naming method for their operations. In 2/3's case in Afghanistan, they would name their operations after hockey teams. Their first operation would be Operation Red Wings, after the Detroit Red Wings. Oddly, all media reports and a book recently published on an aspect of Red Wings incorrectly states the name of the operation. I've seen "Operation Redwings" and "Operation Redwing" (Operation Redwing was a 1956 series of thermonuclear weapons tests on Eniwetok and Bikini Atolls in the South Pacific), even "Operation Red Wing." I know that this is a small detail, but details count. Look up "Operation Red Wings" in Google, and you'll see just a handful of results, but one of these is a report, published in the Marine Corps Gazette, written by senior battalion leadership. It is an excellent article. For reasons I'll explain in the book, the Marines employed Navy SEALs in this operation for the opening phases of Red Wings. 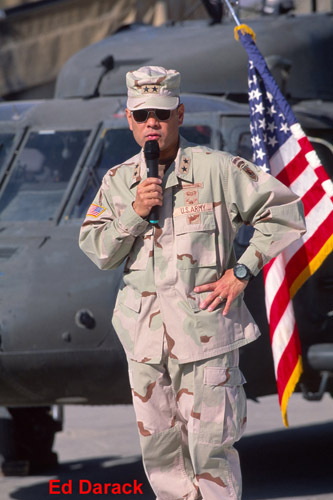 A disaster ensued, resulting in the greatest single-day loss of life for the SEALs as well as the aviation supporting element, the 160th SOAR(A), AKA the 'Nightstalkers.' Most of those involved don't know why the SEALs were asked to be a part of Red Wings. I was surprised when I found out; the reason involves the complex and often times tenuous relationships among conventional branches of the military and special operations units. The initial phase of the operation had a Navy Special Operations team insert (via an MH-47D of the 160th) near the summit of Sawtalo Sar. The SEALs planned the specifics of this phase of the operation, and they chose to use a 4 man team. 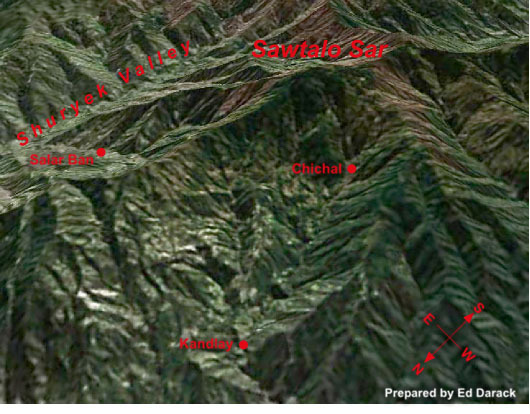 The four were to surveil 4 NAIs (named areas of interest) total, one around the village of Chichal in the Korangal Valley and three on the upper north ridge of Sawtalo Sar massif. Just hours after the insert, in the morning of June 28th, they were 'soft compromised' by a goat herder (goat herders are common in this area, we ran across them all the time on operations in the Kunar Province). Minutes after the soft compromise, the team was hard compromised by a number of Shah's men (soft compromised means opposing forces have detected you, hard compromised means they're trying to kill you). Shah's guys killed three of the SEALs, and the sole survivor made his way to a village in the area, where he was taken in and protected, eventually to be rescued. 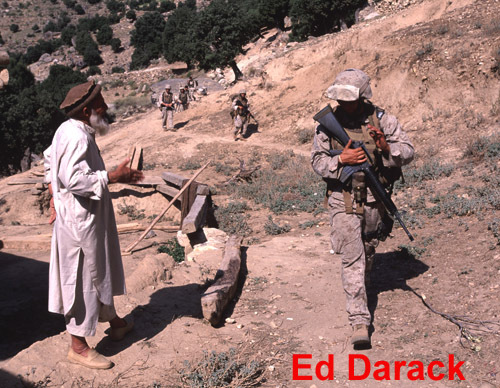 Operation Whalers (Named for the Hartford / New England Whalers, a team moved in 1997 to Raleigh, North Carolina and subsequently known as the Carolina Hurricanes), saw the Marines hunt down Ahmad Shah's forces and successfully destroy his operation and chase him out of the region. A Marine of Fox Company actually shot him, but Shah didn't die. 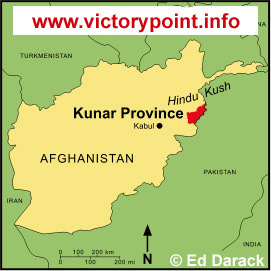 Instead, he and his followers fled to Pakistan, and then went south of the Kunar Province. I'd write a lot more on this, as well as Red Wings 2, but I don't want to give away too much. Suffice it to say, Red Wings and Whalers represent an amazing drama of modern warfare--and one that has been virtually unreported, totally overshadowed in the media by the special operations disaster. I'm a freelance stock photographer and writer. My specialty over the last few years has been covering the United States Marine Corps (specifically, 2/3, mountain warfare, and close air support and USMC combined arms tactics), although I've never been in the military. Through the years I've written about and photographed a variety of topics. One of my specialties has been alpine environments and mountaineering. 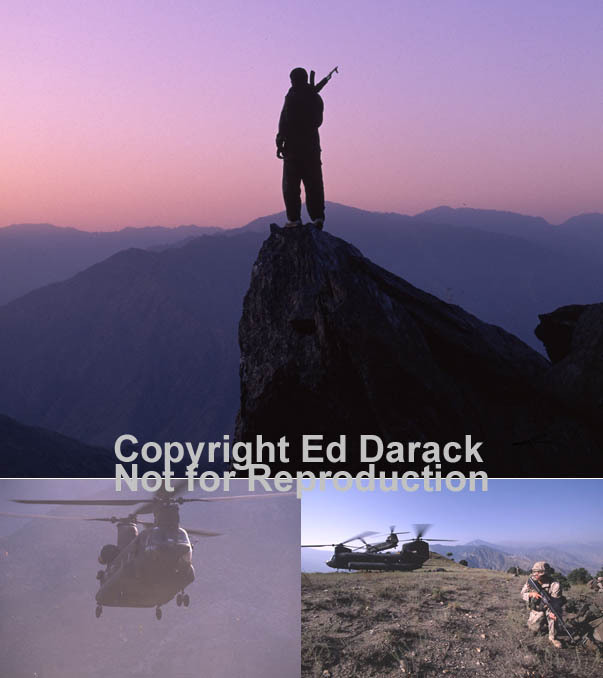 In late 2004, I had the idea to write an article / shoot stock imagery of a small, relatively unknown Marine Corps base in the mountains of eastern California, The Mountain Warfare Training Center, where Marines and other military forces combine mountaineering skills with those of combat. While at the MWTC I met the 2nd Battalion of the 3rd Marine Regiment, based out of Kaneohe Bay, Hawaii. The Battalion was in the throes of their predeployment workup for their upcoming deployment to Afghanistan. After embedding with their units during mountain training, I asked if I could travel with them to Afghanistan; they said yes. After following the Marines in the summer Mountain Leader Course (a course run out of the MWTC), I traveled to Afghanistan in September of 2005 and was immediately thrust into one of the wildest outposts in the Global War on Terror, a place called Camp Blessing, from which I embarked with the Marines of 1st Platoon, Company E, 2/3 and attached indigenous fighters on a number of multi-day combat operations. I've subsequently embedded with 2/3 in Haditha, Iraq, as well as their predeployment training and return to Hawaii. I've come to know many of the Marines of this battalion, from lance corporal up to the battalion commander In addition to having made some truly great friends, I've had a great deal of information on their time in Afghanistan declassified and handed over to me. This information, in addition to my interviews with countless Marines of 2/3 (as well as my real-world experience following Marines in both mountain warfare training and actual combat), is the basis for the book Sawtalo Sar: The Untold Story of Operations Red Wings and Whalers. After 1 and 1/2 years of research, I'm hard at work finishing this exciting project. My goal is to provide the most accurate recounting of both Operation Red Wings and Operation Whalers, and to grant an inside, realistic view of such dangerous and difficult operations as well as grant lucid, fresh insight into how the Marine Corps operates as well as how conventional forces work with special operations forces in today's combat environments. The project has been fascinating, and the book will be too. Planimetric view of Sawtalo Sar, the Pech River region. Prepared from Google Earth imagery. 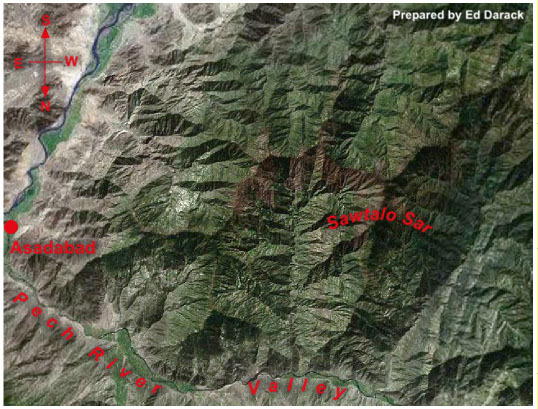 Oblique view of Sawtalo Sar, showing the Shuryek Valley, Salar Ban, the north ridge of Sawtalo Sar, and the uppermost aspects of the Korangal Valley, including the village of Chichal. 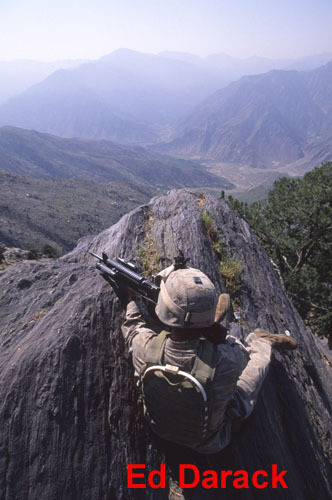 Marine of 1st Platoon, Company E, 2nd Battalion of the 3rd Marine Regiment in a covered position across from Sawtalo Sar and the opening of the Korangal Valley, Operation Valdez, October, 2005. 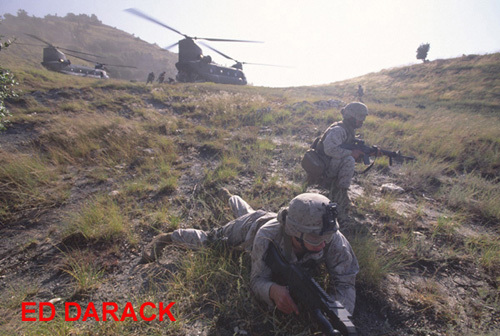 Side by side helicopter insert, "Big Windy" Chinooks, of Task Force Saber, inserting the Marines of 1st Platoon, Company E, 2/3 and attached ASF, October 2005. This is a typical, conventional helicopter insert. SEAD package ran first (suppression of enemy air defenses), as well as a CAS package pushed into the area (Type 3 control, controller in the rear deconflicting as an ad hoc FSC), both rotary (AH-64) and fixed wing (A-10). All of this is explained in the book. This insert took place across the Pech River Valley from Sawtalo Sar. Across the Pech River Valley from Sawtalo Sar, helicopter insert, ASF (attached to the Marines) in foreground with RPG. Navy Corpsman lending a hand for perimeter defense as Marines and ASF unload the Chinooks. Marines push through a remote village near Sawtalo Sar during Operation Pil, October, 2005. MajGen Jason Kamiya, CG of CJTF-76 (TF-76 was in charge of combat operations throughout Afghanistan during the time 2/3 was in country). Battalion planners briefed Operation Red Wings and Operation Whalers all to way to Kamiya. Bagram, September, 2005. I did not take this picture. Credited to Battalion, during Red Wings 2. This is Sawtalo Sar, near the insert / shootdown point. Declassified specifically for this project. I did not take this picture either. 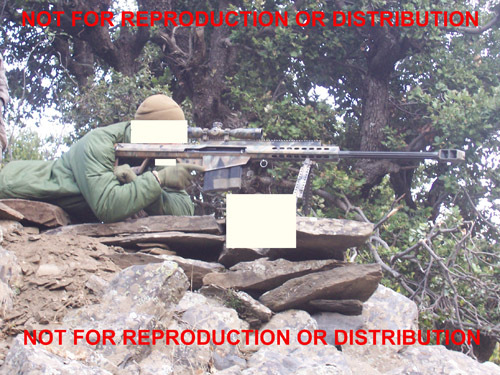 Marine scout sniper team leader on Sawtalo Sar, using the SASR (also known as the Barrett, a .50 caliber sniper rifle). Declassified image not for reproduction. 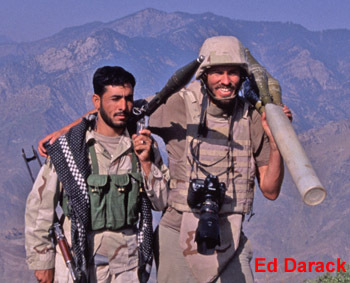 The author, in helmet with camera in the Hindu Kush, embedded with 1st Platoon, Company E, 2/3, Kunar Province, Afghanistan, October, 2005. 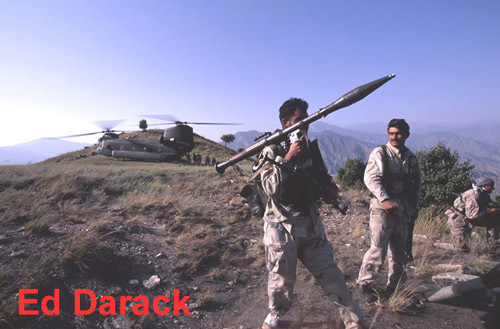 The other guy, holding the RPG launcher, is a member of the ASF, co-located with 1st Platoon, who accompanied the Marines on most operations.